In addition to the traditional WMS protocol, in our Petrosys 17.8 release we introduced the ability to display tiled georeferenced imagery (WMTS), ArcGIS Server and Bing Maps . In the 17.8 release we also added the ability to display secured web map services (https), required not only for vendors serving high-value imagery, but also for clients wanting to serve internal data. 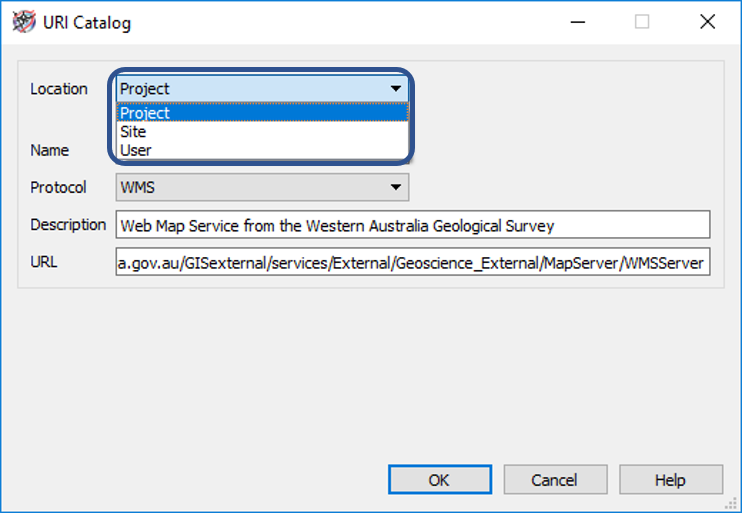 Support to display spatial data from web feature services (WFS and ArcGIS Server) was introduced in Petrosys PRO 2018.1. This new feature in our software allow clients to access vector data over the internet. 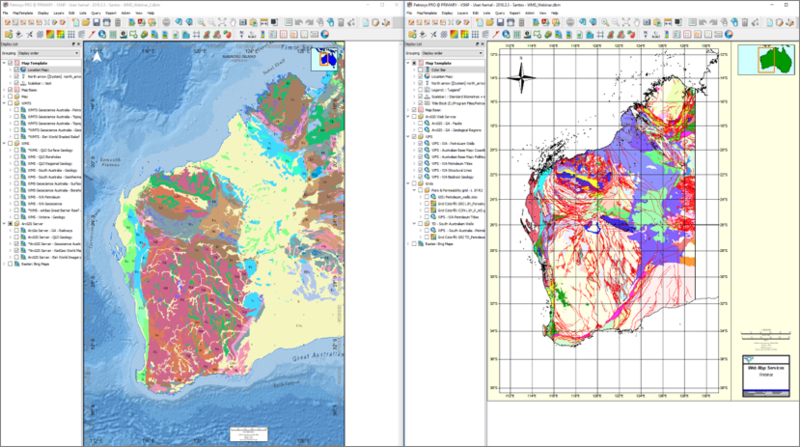 Both maps are displaying surface geology from the Western Australia Geological Survey web services: in the left, raster imagery (WMS protocol); in the right, spatial data (WFS protocol). 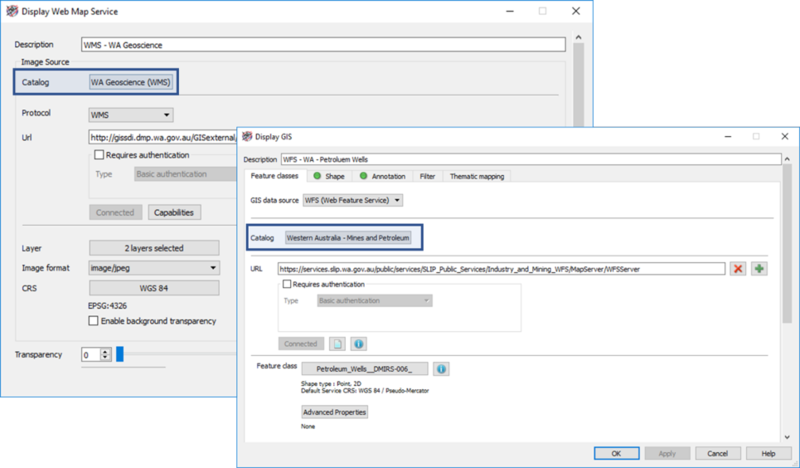 Regarding how to access and use these web services in Petrosys PRO, we have included the ability to store these services in a catalog. This feature allows all the users an easy and effective way to quickly access any of the services already stored. To view the catalog and being able to choose any of the services, click in the box next to ‘Catalog’ for both web map and feature services  (see below screenshot). Once in the ‘Web Service Catalog’, as previously mentioned, you can choose from one of the saved services. You can manage the catalog by selecting the options in the lower left section of the panel: Edit, Delete and Add. Site: stored at the local directory. If the site has configured a shared local directory, then all the users will have access to this service. User: store locally. Only the current user will be able to see this service. Storing the services at Site level may provide the most effective way to manage your web service catalog. As an example of what is mentioned above, big to medium sites may have an administrator of the catalog. Using a shared local directory , this person could save all new services at Site level, making the catalog with all the web map and feature services available to every user! For more info about this and many more topics, visit the Learn section in the Client Portal or contact us at support@petrosys.com.au.